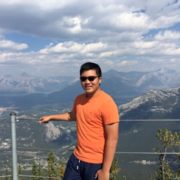 This project is created during Cipher Major League Hacking Local Hack Day 2016 in Brampton, Ontario. This is awarded with Best Project with Mentor. We essentially had three plans: a muchanical music box, a dab machine, and a water bottle flipper. Seeing and listening to the ever popular "floppy disk music" Imperial March on YouTube inspired us to create our own mechanical music box. 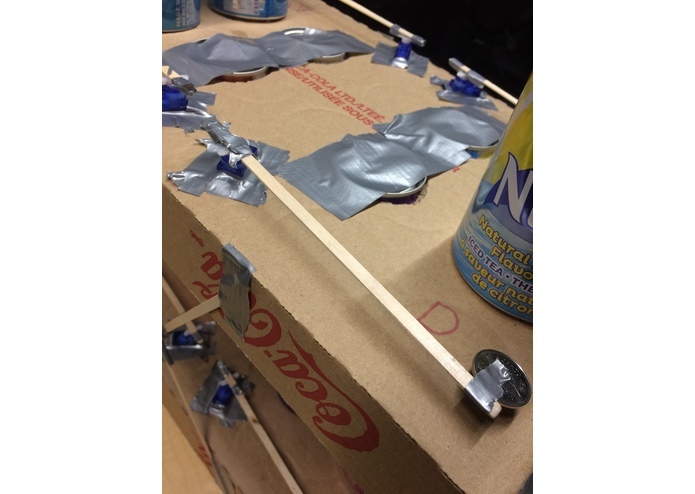 Our hack is able to play music by hitting the cans. 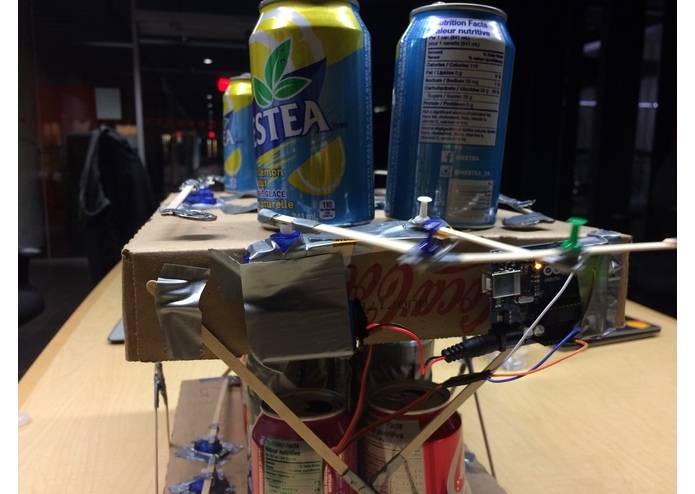 It has 8 cans for 8 notes (C, D, E, F, G, A, B, C), and 8 servos to hit the cans. In addition, it is able to take a MIDI file (a form of audio files) and play the notes. That means you can import whatever music you and the machine will play it! It also have a cool dabbing machine which dabs all the time. Structure - Building the frame with the cans and the boxes. Servos - Attaching 9 servos and their respective stick/coin arms. Tuning - Filling the cans with water to tune them to their appropriate pitch. Electrical consisted mainly of wiring 9 servos to the Arduino board and mapping out the contraption. We use Arduino UNO to control servos and 9V batteries. Arduino to Servo - Outputting information the servos to the Arduino, fine tuning the parameters to hit the cans correctly. MIDI to Serial - Parsing MIDI files and sending them to the Arduino code as easy to read information in hitting the cans (done in Python). There were many problems in the gathering of the materials, as we were initially planning to make an elastic band guitar but could not find strong elastic bands to pluck. The serial communication between the Python code and the Arduino was not working properly and as such the servos were not hitting the cans in the correct order. Water was hard to get into the cans (without spilling), and it was extremely easy to overfill the cans. We successfully communicate Arduino and a audio file from our laptop! Our project revolved mainly around using Arduino, something that some of us have never used before in the past! We learned a lot about how to program/use hardware and how to connect software/hardware. We also learned how to parse MIDI files into useful information. We learned how to manipulate liquid and cans to make sounds. Lastly, for some of us, it was our first hackathon! We had tons of fun! For the mentees, it was their first hackathon, and the entire event seemed fairly daunting. 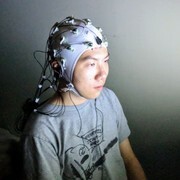 It is also their first hardware hack. Fortunately, the entire process was very smooth, with the mentor guiding the learning and hack creation very well. They successfully learned how to use microcontrollers and circuits, and was able to develop a successful project. For the mentor, it was his first time mentoring others. He tries to guide the mentees to self-learn and The mentor learned a lot about communication skill, leadership, and project management. The mentor was really impressed by what the mentees have learned and created. I was a mentor (hacker guru) for this project. I discussed ideas, set plans, teach my mentees Arduino and Python. I helped them with mechanical , electrical and coding aspects of the design. 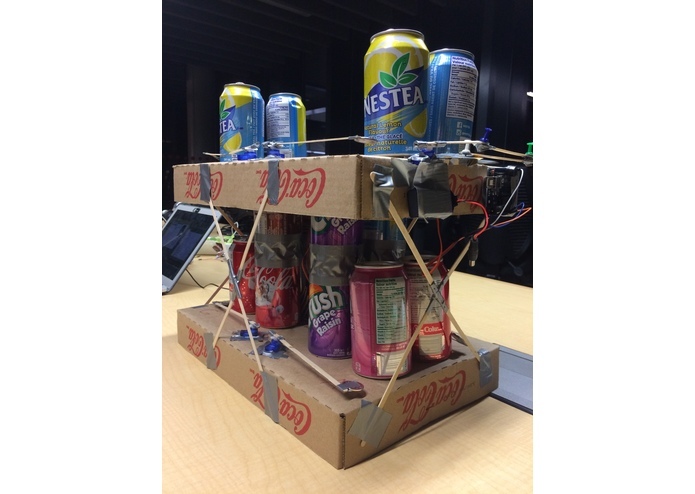 I built most of the hardware, using reclaimed pop cans and cardboard trays to make the bulk of the structure. I also managed most of the wiring of the servos and the Arduinos. I was the main programmer for the Arduino and MIDI Reader (Python)! I learned how hardware and software work together and how MIDI files are read/used!